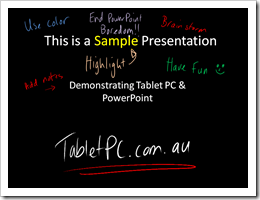 Do you think PowerPoint presentations are overused and boring? You wouldn’t be alone in the business community if you thought that. Well, Tablet PCs create a way for you to change all of that. 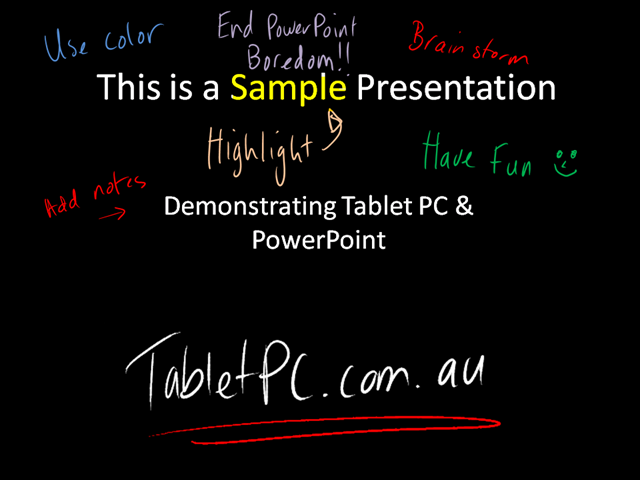 Hook your Tablet PC up to a projector and you’ve got a lot more than a boring slide machine… You’ve now got yourself an interactive presentation tool. That’s not just corporate speak, I’m serious! Click on the picture above to download the sample PowerPoint 2007 file. By the way, you can use digital ink in Office 2003 too.